Taking bus from Melaka to Mersing for ferry to Tioman Island is the most convenient option after spending your holiday in the historical-rich Melaka. Mersing is a well-known gateway town to Tioman Island. Upon arrival at Mersing bus terminal, passengers could just walk to the opposite Mersing jetty for ferry to Tioman Island. S&S International is the only operator serving bus from Melaka to Mersing. Melaka Sentral is the bus terminal in Malacca to catch the bus to Mersing. S&S International provides 3 departure schedules daily at 08:00, 12:45 and 18:15. 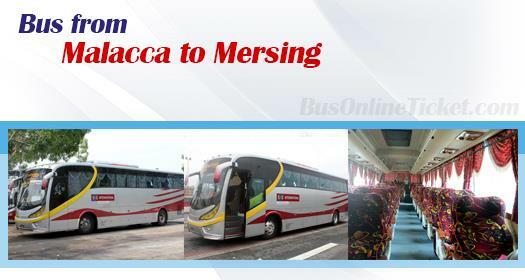 With one bus service to Mersing each in the morning, afternoon and evening, travellers could plan their trip to Mersing for ferry in flexible way. The bus journey from Melaka to Mersing takes about 4.5 hours. If passengers need a stopover for toilet break, please inform the driver so that the bus can stop along the resting area along the highway. The bus fare for S&S International bus from Melaka to Mersing is reasonably charged at about RM 25.10. The bus from Melaka terminates at Mersing bus terminal. Mersing jetty is just 5-10 minutes walking distance away from Mersing bus terminal. At Mersing jetty, travellers could buy the ferry ticket provided by Bluewater Express Speed Ferry to Tioman Island. Kindly note that ferry schedule from Mersing Jetty to Tioman Island is not subjected to change due to the tidal conditions. Passenger can now book bus ticket from Melaka to Mersing online with BusOnlineTicket.com. Booking is instantly confirmed upon payment. Passengers would have peace of mind that tickets have been secured before travelling.